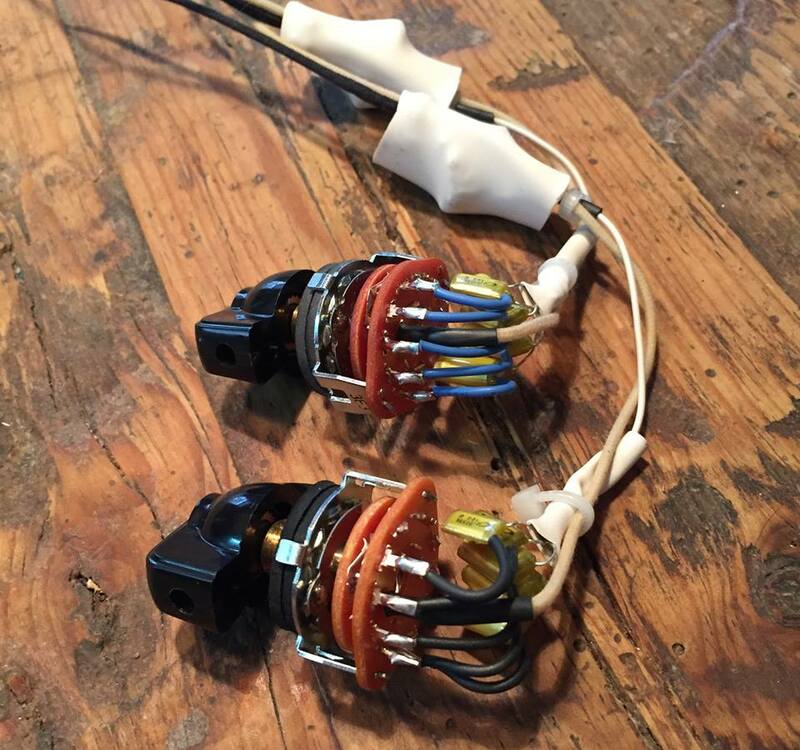 We have been building these high quality varitone switches since the year 2000, and have installed them in countless customer guitars. They have been used by thousands of players worldwide ranging from touring pros to weekend warrirors. Our customers have been telling us this is by far the best sounding one on the market. Please listen to the samples below to see if you agree. There are a lot of factors separating our varitones from that of the competitors. For starters, the small details matter. You will notice that all sensitive connections are insulated with heat shrink tubing, an not simply wrapped in electrical tape. Each unit is hand wired using only top notch components and vintage style cloth wire. The type of switch we use will minimize any poppng noise, which is a common problem on Varitone controls. A very important thing is that we are using a choke, and many of our competitors are selling these with just capacitors. You will notice we include rubber washers, which we find the best way to mount these into guitars & basses to avoid slippage. Again. the small details matter. If you play in a strumming/jangly fasion with with a reasonably clean tone, you will find the filter will make the guitar sound more and more acoustic like as you progess through the filters. Check out the following sample of me playing a lightly gritty jangly strumming pattern using the bridge pickup of my Gibson Pat Martino customs shop. Comes with Chicken Head knob, but you can put any knob on this provided it tightens with a set screw. 1-5 dial plate available for $10 extra. Voiced for a bass guitar.